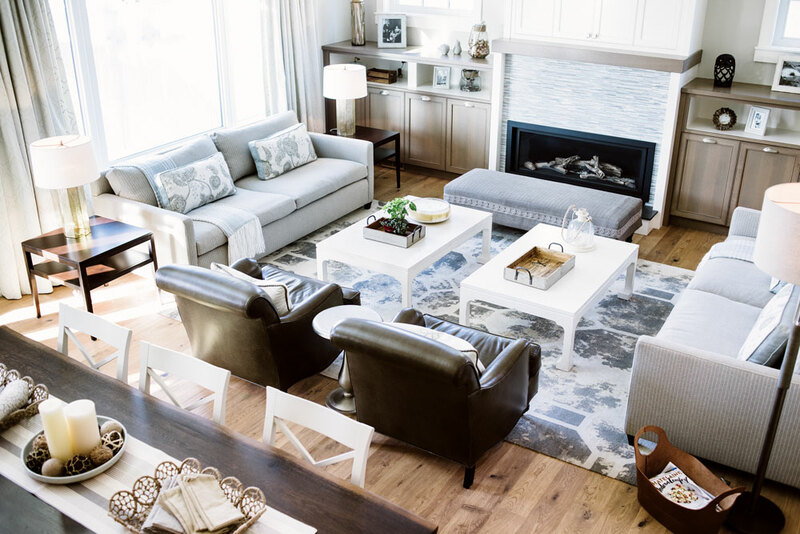 A Crossfield couple enlists local talent to build a western prairie home with east-coast flair. 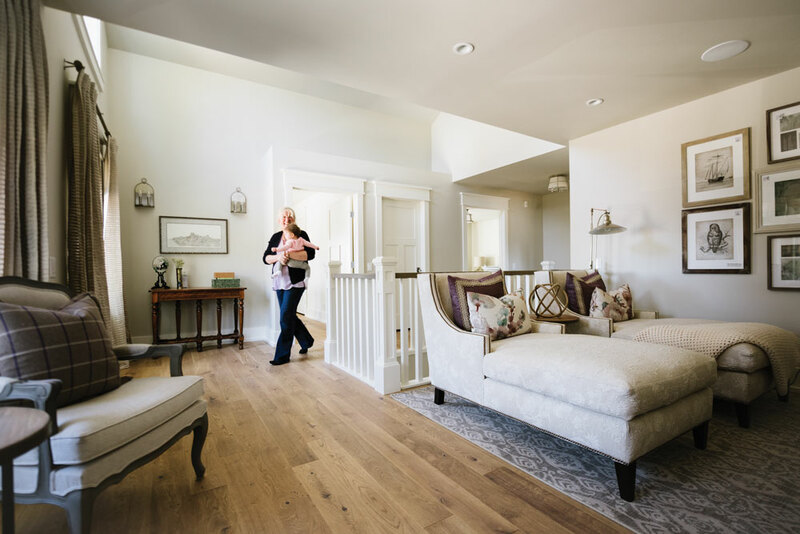 The homeowners play with interior designer Heather Draper’s daughter in the sun-splashed open kitchen, which features custom-made cabinetry by local Crossfield artisans. Lighting, custom drapery, cushions, custom furniture and flooring from The Heather Company. Plumbing fixtures from Robinson Lighting & Bath Centre. Custom millwork by C3 Crossfield Custom Cabinetry. Hardware from Banbury Lane. Countertops from Stone Selection. Wolf and Subzero appliances from Trail Appliances. C2 Paint on walls in Smidgen Kitchen, Cotton Island and Cousteau. The design inspiration for Liz and Calvin Helfrich’s dream home all began with a trip to Charlottetown, P.E.I. for a wedding. “We stayed in this charming old inn called Sutherland House,” recalls Liz. The couple returned home to the quaint town of Crossfield, 50 kilometres north of Calgary, and had drawings made from the photograph. They already had the site, having purchased a 100-foot-wide lot on a pretty tree-lined street 10 years prior. Armed with a set of drawings and a strong vision, the couple hired Calgary-based Heather Draper, principal designer and creative director at The Heather Company, to assist with the interior spaces. 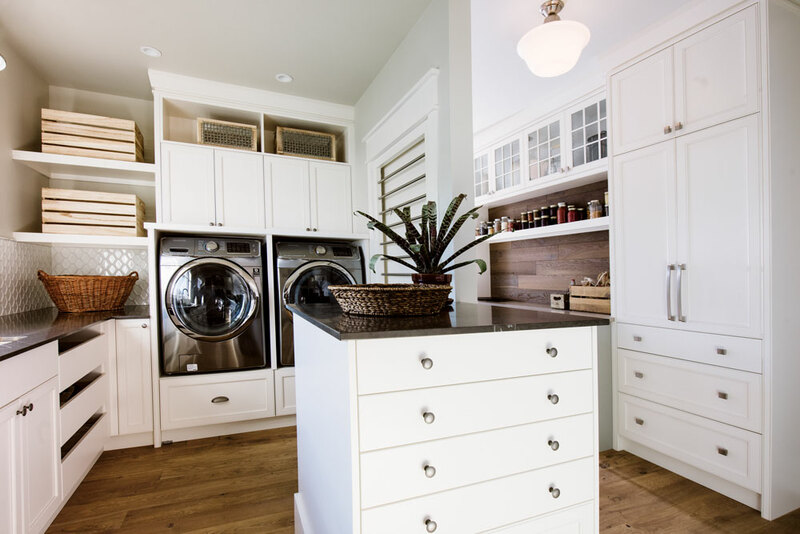 After checking out the site and getting a feel for what the Helfriches wanted, Draper rejigged the floor plan, adding a pantry, a mudroom and a laundry room. She also vaulted the main-floor great-room ceiling, designed a professional-calibre kitchen and sketched beautiful millwork throughout. Draper chose finishes for the home that presented an air of elegance – marble; leathered granite; wide-planked, oiled, brushed-oak flooring; textured porcelain tile; grasscloth wall coverings; white-lacquered wood panelling – and old-world details such as plinth blocks, transoms and cornices. “I wanted the home to have this sense of eclecticness, like it could have been built over time and it could have been here for 100 years,” says Draper. For the Helfriches, Crossfield is home. They raised their family here and are prominent members of the business community (they owned the local KalTire as well as the KalTire in nearby Airdrie and are now property developers in the area). When they became empty nesters two years ago, the couple set out to build a home for the next phase of life, a place where the entire family could gather for celebratory events and holiday meals. “We dreamed of having our kids and the grandkids home, and lots of family and friends,” says Liz. When it came time to set the plan in motion, the couple wanted to fuel the local economy. “For us, it was really important to hire local people,” says Calvin, who recruited his brother, owner of Helfrich Construction, to build the home. Luckily, as the Helfriches already knew, Crossfield is a hotbed of creativity and high-quality craftsmanship. The custom millwork, the architectural hood fan and kitchen cabinetry were created four blocks away at C3 Crossfield Custom Cabinets. Liz’s top priority for the design of the home focused around the kitchen and the open great-room spaces. But for Calvin, whose passion revolves around cars, a space to hang with the guys, and tinker with his “toys” was paramount, especially after the sale of his two KalTire shops. To achieve this, Draper created two distinct spaces for Calvin, adding an old-world brick fireplace, leathered granite bar and games room to the lower level of the home, and creating the ultimate “guy space” – a 2,500-square-foot, stand-alone garage with two hoists, a granite bar with aluminum slot wall backsplash and heated polished-concrete floors. Here, Calvin proudly stores and works on his two babies: a 1969 GTO Convertible and a 1969 Chevelle SS. 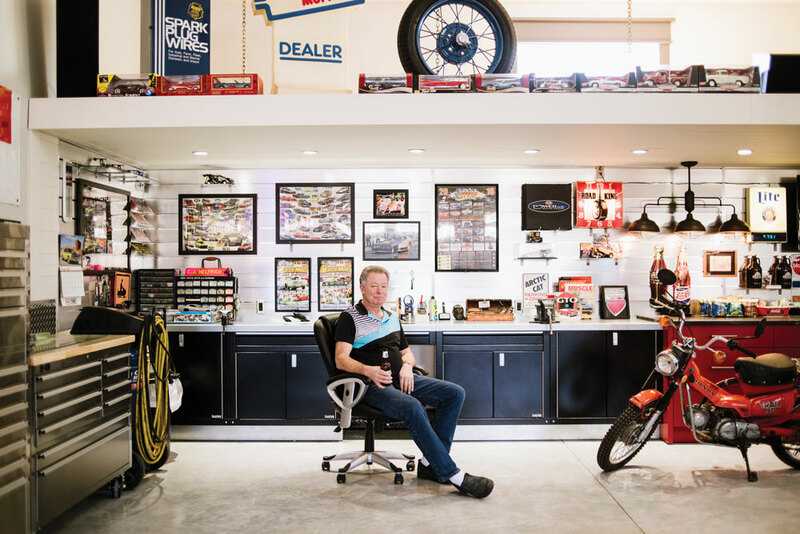 “I spend most of my spare time out here putzing around,” he says, gesturing to his “toys,” which include a snowmobile and refurbished circa 1969 dirt bike, and his tools. The walls are adorned with neon signs, posters and fun kitsch collected over the years at drag races, show-and-shines and through the tire business. “I asked Calvin to lay [his collectibles] all out on the floor of the garage and when I came to look at them, I don’t think that I was mentally prepared – there were just so many. It took three full days to put them all up and we still aren’t done,” says Draper. A tray ceiling adds architectural detail, as does a brick wall and four skylights. One of the walls opens to the backyard outdoor living space (perfect for summer barbecues) while three floor-to-ceiling bay-style garage doors open to the heated stone-tiled driveway. No shovelling required. The living room is a hub for the family and features multiple layers of textiles, materials and finishes – hallmarks of interior designer Heather Draper’s approach. Lamps, custom drapery, cushions, custom furniture and flooring from The Heather Company. Hanging light from Restoration Hardware. Custom Millwork by C3 Crossfield Custom Cabinetry. Hardware from Banbury Lane. Area rug from Colin Campbell. C2 Paint on walls in Smidgen and on cabinets in Cotton. Painting by Rosanna Marmont. Decor accessories from HomeSense. In the dining room, a custom-designed fumed oak harvest table creates a rustic feel. The vaulted ceiling is clad in whitewashed planking, giving the room a warm and welcoming feel. Lighting, custom drapery, cushions, custom furniture and flooring from The Heather Company. Custom millwork by C3 Crossfield Custom Cabinetry. Hardware from Banbury Lane. C2 Paint on walls in Smidgen Kitchen, Cotton Island and Cousteau. 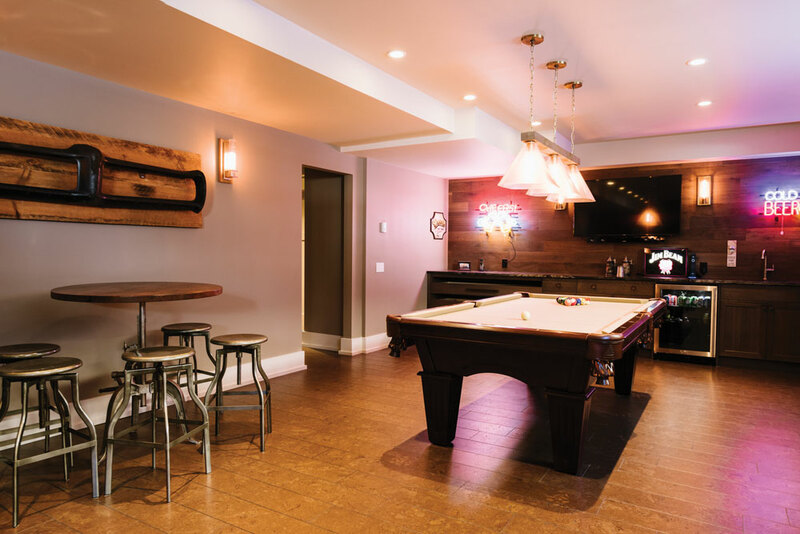 The 2,000-square-foot garage is the ultimate man-cave with its built-in bar, heated floors, and brick finishes. Red cabinetry by C3 Crossfield Custom Cabinetry. Lighting from Rona. Vintage cars – including a 1969 GTO Convertible and a 1969 Chevelle SS – take centre stage in the garage. The main-floor master bedroom exudes a sense of peace and calm. A crystal chandelier from Restoration Hardware sets an elegant tone. Lamps, custom drapery, cushions, custom furniture and flooring from The Heather Company. Hanging light from Restoration Hardware. Area rug from Colin Campbell. C2 Paint on walls in Grout. Decor accessories from HomeSense. 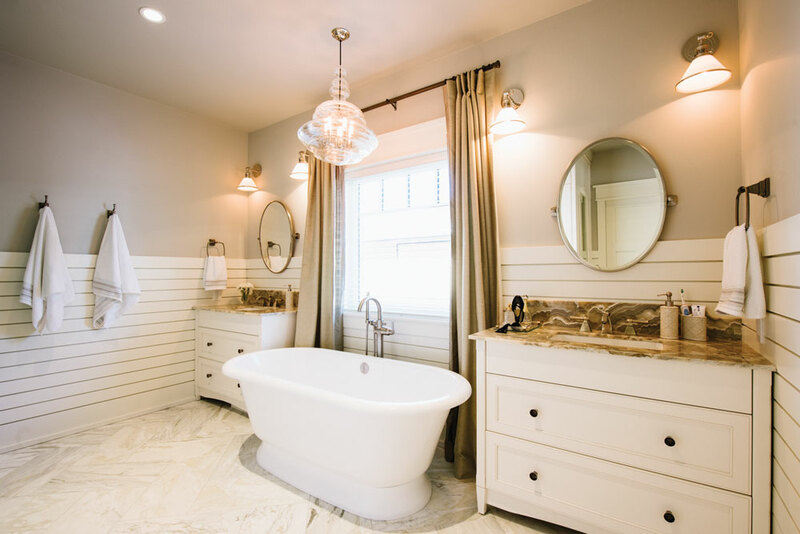 A free-standing tub anchors the master bathroom. Brushed stone countertops and a stunning fixture from Hudson Valley complete the look. Lighting and custom drapery from The Heather Company. Plumbing fixtures from Robinson Lighting & Bath Centre. Tub is by Victoria and Albert. Custom Millwork by C3 Crossfield Custom Cabinetry. Hardware and mirrors from Banbury Lane. Countertops from Stone Selection. C2 Paint on walls in Vancouver Sky, and on cabinets and trim in Cotton. In the mudroom, honed marble counters offer lots of space, while built-in drying racks on the far wall make laundry a snap. Lighting from The Heather Company. Plumbing fixtures from Robinson Lighting & Bath Centre. Custom Millwork by C3 Crossfield Custom Cabinetry. Hardware from Banbury Lane. Countertops from Stone Selection. Appliances from Trail Appliances. C2 Paint on walls in Smidgen and on cabinets in Cotton Island. Tile from Tierra Sol Ceramic Tile. Baskets from HomeSense. The upstairs flex space is a favourite spot to relax and hang out. Lighting, custom drapery, cushions, custom furniture and flooring from The Heather Company. Area rug from Colin Campbell. The lower-level entertainment room includes a pool table and a bar. While a uniform approach is easy, layered window treatments that meet the needs of the rooms – from beautiful flowing drapes in social rooms to black-out blinds in bedrooms – create personality in each separate space. Millwork elevates interior spaces, giving a home a timeless look, plus it gives a wall extra protection and durability in high traffic areas like staircases and mudrooms. Nothing screams “new house!” like furniture that looks like it just walked off the showroom floor. A mix of styles and fabrics is key to curating a space that feels collected over time. Consider reworking existing pieces with new upholstery and a coat of stain or paint. An array of lighting styles steps up a home’s ambiance and completes the design picture. Hang stunning fixtures in unexpected places like bedrooms and hallways to tie everything together. Create spaces in the home to artfully showcase family photos, collections or hobbies. Just remember the age-old adage of less is more. Practice restraint and think creatively.